, a dramatic poet, and translator of Homer, was born in 1557, as generally supposed, in Kent, but we have no account at what school he was educated: he was, however, sent to the university when he was about seventeen years of age, and spent about two years at Trinity college, Oxford, where he paid little attention to logic or philosophy, but was eminently distinguished for his knowledge in the Greek and Roman classics. About the year 1576 he quitted the university, and repaired to the metropolis, where he commenced a friendship with Shakspeare, Spenser, Daniel, Marlow, and other celebrated wits. In 1595 he published, in 4to, a poem entitled “Ovid’s Banquet of Sauce, a coronet for his mistress philosophy, and his amorous zodiac:” to which he added, a translation of a poem into English, called “The amorous contention of Phillis and Flora,” written in Latin by a friar in 1400. The following year he published | in 4to, “The Shield of Achilles,’ 7 from Homer; and soon after, in the same year, a translation of seven books of the Iliad, in 4to. In 1600, fifteen books were printed in a thin folio; and lastly, without date, an entire translation of the Iliad, in folio, under the following title:” The Iliads of Homer, Prince of Poets. Never before in any language truly translated. 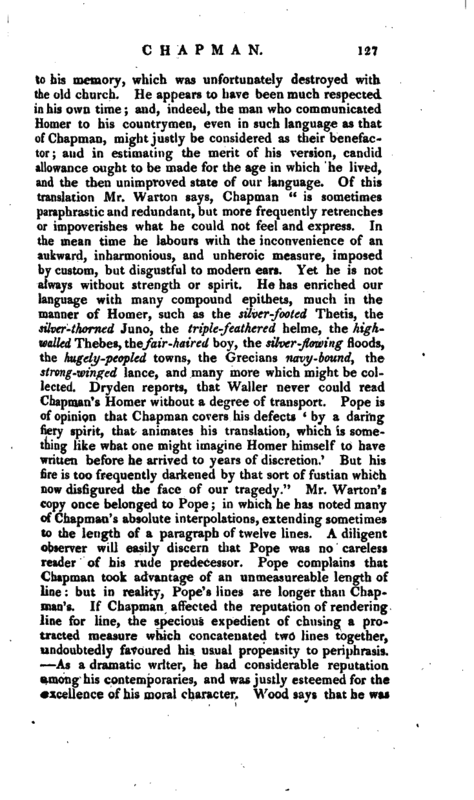 With a comment upon some of his chief places: done according to the Greek by George Chapman. At London, printed by Nathaniel Butter." 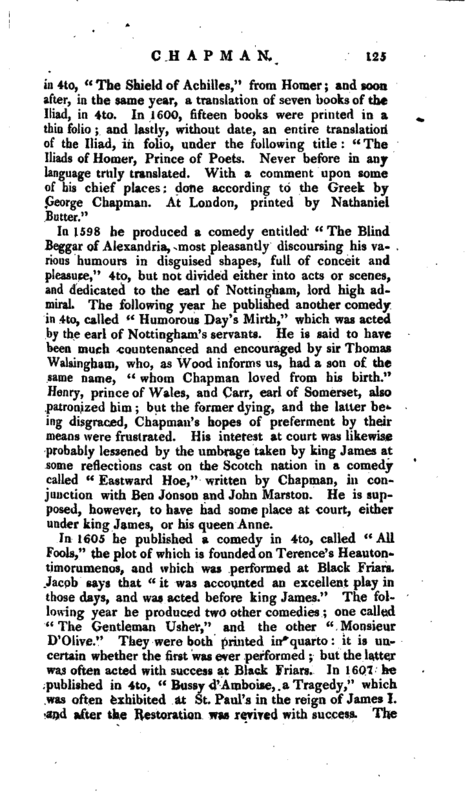 In 1598 he produced a comedy entitled “The Blind Beggar of Alexandria, most pleasantly discoursing his various humours in disguised shapes, full of conceit and pleasure,” 4to, but not divided either into acts or scenes, and dedicated to the earl of Nottingham, lord high admiral. The following year he published another comedy in 4to, called “Humorous Day’s Mirth,‘’ which was acted by the earl of Nottingham’s servants. He is said to have been much countenanced and encouraged by sir Thomas Walsingham, who, as Wood informs us, had a son of the same name,” whom Chapman loved from his birth.“Henry, prince of Wales, and Carr, earl of Somerset, also patronized him; but the former dying, and the latter being disgraced, Chapman’s hopes of preferment by their means were frustrated. His interest at court was likewise probably lessened by the umbrage taken by king James at some reflections cast on the Scotch nation in a comedy _ called” Eastward Hoe," written by Chapman, in conjunction with Ben Jonson and John Marston. He is supposed, however, to have had some place at court, either under king James, or his queen Anne. In 1605 he published a comedy in 4to, called “All Fools,” the plot of which is founded on Terence’s Heautontiniorumenos, and which was performed at Black Friars. Jacob says that “it was accounted an excellent play in those days, and was acted before king James.” The following year he produced two other comedies one called “The Gentleman Usher,” and the other “Monsieur D’Olive.” They were both printed in quarto it is uncertain whether the first was ever performed but the latter was often acted with success at Black Friars. In 1607 he published in 4to, “Bussy d‘Amboise, a Tragedy,” which was often exhibited at St. Paul’s in the reign of James I. ad after the Restoration was revived with success. 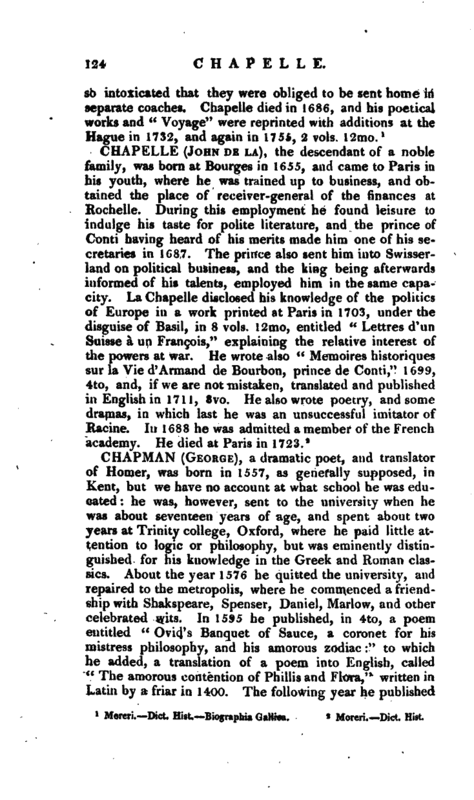 The | same year he published in 4to, “Caesar and Pompey, a lloman Tragedy, declaring their wars, out of whose events is evicted this proposition, Only a just man is a free man.” The following year he produced “The Conspiracy and Tragedy of Charles, duke of Biron, marshal of France,” 4to, performed at Black Friars, in two parts. In 1611 he published in 4to, “May-day,” which is styled a witty comedy, and which was acted at Black Friars; and in 1612 another comedy, called “The Widow’s Tears;” acted both at Black and White Friars. It has been observed, that “some parts of this play are very fine, and the incidents affecting and interesting:” but the catastrophe is thought exceptionable. About this time he published an “Epicede, or Funeral Song on prince Henry;” and when the societies of Lincoln’s Inn and the Middle Temple, in 1613, had resolved to exhibit a splendid masque at Whitehall, in honour of the nuptials of the Palsgrave and the princess Elizabeth, Chapman was employed for the poetry, and Inigo Jones for the machinery. The same year he published, in 4to, a tragedy entitled “Bussy d’Amboise his Revenge,” not acted with much applause. In 1714 he published in 4tq, “Andromeda liberata; or, the Nuptials of Perseus and Andromeda,” dedicated, in a poetical epistle, to Robert, earl of Somerset, and Frances, his countess. The same year he printed his version of the “Odyssey,” which he also dedicated to the earl of Somerset. This was soon followed, by the “Batrachomuomachy,” and the “Hymns,” and “Epigrams.” In 1616 he published in 12mo, a translation of “Musceus,” with a dedication to Inigo Jones, in which he is addressed as the most skilful and ingenious architect that England had yet seen. 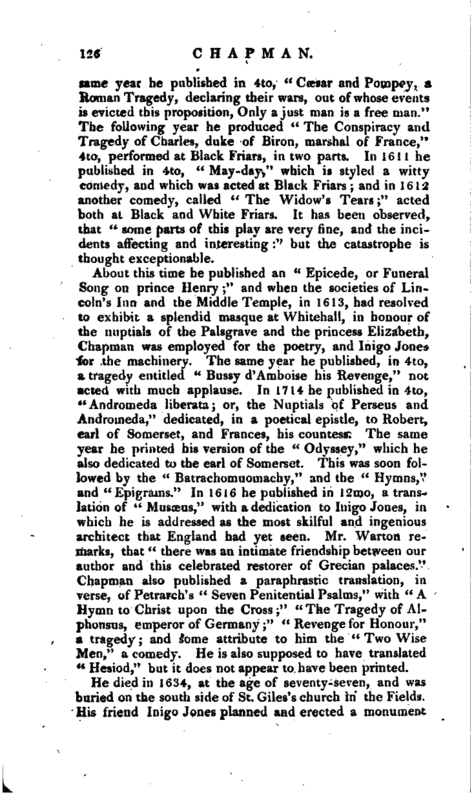 Mr. Warton remarks, that “there was an intimate friendship between our author and this celebrated restorer of Grecian palaces.” Chapman also published a paraphrastic translation, in verse, of Petrarch’s “Seven Penitential Psalms,” with “A xHymn to Christ upon the Cross;” “The Tragedy of Al­>phonsus, emperor of Germany” “Revenge for Honour,” a tragedy and some attribute to him the “Two Wise Men,” a comedy. He is also supposed to have translated “Hesiod,” but it does not appear to have been printed. Biog. Brit.—Warton’s Hist, of Poetry, see Index. ---Biog. 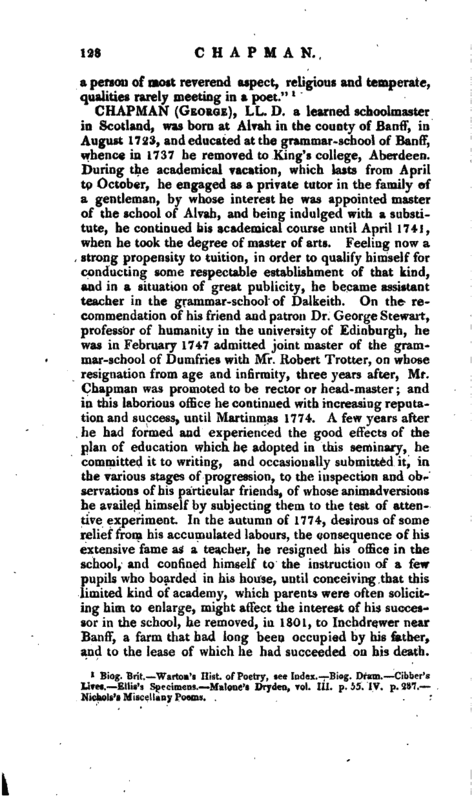 Dram.—Cibber’s Lives.—Ellis’s Specimens.—Malone’s Dryden, vol. III. p. 55. IV. p. 287.— Nichols’s Miscellany Poems.